Thuan was born in Saigon, Vietnam, before emigrating to the United States with his family in 1996. He was a member of the program from 2013-15, which included two top ten finishes at Nationals. As a competitor, Thuan received an individual award as a witness. After graduation, Thuan worked as a paralegal at the Department of Justice and later attended Washington & Lee Law School. 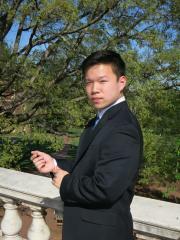 View Thuan's career individual awards by clicking here.